Identity card : A French identity card is sufficient. Recall that the license is not a travel document. Payment Cards The international credit cards are widely accepted, many islands have no banks or ATMs, have realistic liquid on you . Air: You will arrive in French Polynesia via Tahiti Fa'a'a International Airport at 5 km west of Papeetē. A flight from Paris to Papeete costs around 1100 euros round trip, and it takes 20 hours of flight time (plus a stop for 2 hours). The main airline that operates in French Polynesia is Air Tahiti Nui. Car The road network is developed mainly in Tahiti is the largest island of French Polynesia . boat connections boats are ensured between the nearby islands and motus, these islands bordering sometimes larger islands, which are popular with tourists for its beaches. The connection the busiest ferry is Papeete, Moorea . plane To travel between the islands of small airports exist everywhere and are serviced regularly by Air Tahiti and Air Moorea. It is necessary to take the plane to reach the remote islands, the archipelagos of French Polynesia covers a very large area (about size of Europe). 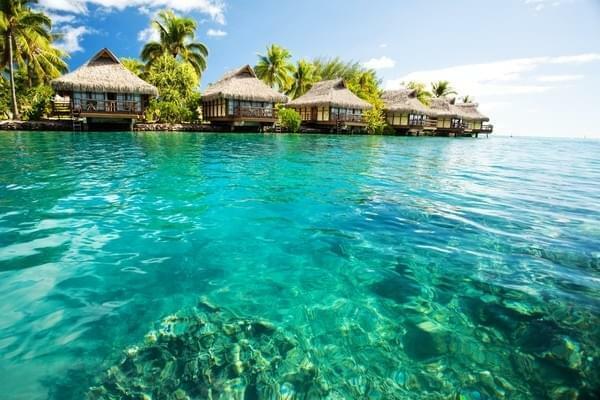 Tips : Medical coverage is good in the most important islands, the main hospital in Polynesia is the Taone hospital in Tahiti . Flight and delinquency: Polynesia is very safe, no a priori reason to worry, however, as everywhere minimal vigilance is to adopt . Average temperatures 25 & deg; C in summer and 25 & deg; C in winter . Best time to reach There are two seasons, the hot and humid from November to April, the other cooler and less humid from May to October. All islands are under threat of hurricane risk from December to March, consequently avoid this season to go to French Polynesia. Electrical Outlets : European connectors . internet, wifi : There are Internet cafes in Tahiti, Moorea, Huahine, Bora Boora, Raiatea and Rangiroa. Most hotels offer free wifi.